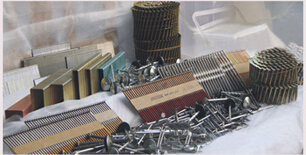 Product categories of Collated Nail, we are specialized manufacturers from China, Collated Nail, Collated Coil Nails suppliers/factory, wholesale high-quality products of Galvanized Collated Nails R & D and manufacturing, we have the perfect after-sales service and technical support. Look forward to your cooperation! Collected nails are nails that are in someway attached to each other in a strip or coil. The most popular collation are plastic, wire weld, and paper for stick nails. Coil nails are typically either wired weld or plastic coated strip. Collected nails are bands of nails used in nail guns. They are used to quickly construct wooden framing without having to manually hammering in each nai. Air driven nails are very effective. I've usd hundreds of boxes of them and never had on fail yet. The surface treatment of them: hot dipped galvanized or electro galvanized. Packing : in cartons.